Honed & Filled Lydia Classico – Travertine that graced the homes and palaces of Kings, Queens and Emperors alike; ours are chosen from the exquisite Ionic Stone travertine range, great quality, beautiful finish. 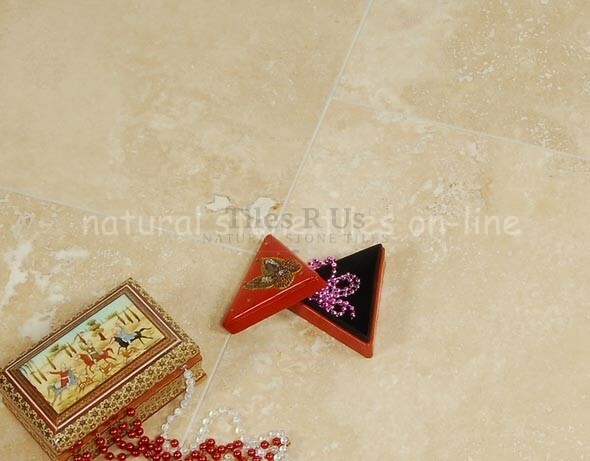 A wonderful travertine showing creamy, beige colour; also known as medium light classic travertine. It is very consistent in terms of colour and very minimal variation occurs. The Opus Versailles Pattern is a selection of tiles of different sizes that are laid in an authentic pattern just as the ancient stone masons would have laid them out. The Versailles pattern is sold as square metres and the pattern repeats within each square metre, the Opus pattern shown below is a suggested layout - you can of course design your own layout to suite your preference and the design style you have planned for your rooms. WALLSTONE RANGE AVAILABLE! All Clasico tiles of 10mm thickness are ideal for use as wall tiles suitable for laying on PLASTERBOARD; the tile size has been selected to be ideal for walls. The reduced tile thickness means the weight per square metre remains below 32kg/m2 which is the limit specified in building regulations. This includes the weight of adhesive and grout.